The business of the State is to provide all possible facilities for co –operative action. The present trend of thinking in the progressive mind of our age is towards autonomy, decentralization and self – government. This thinking is in the right direction because in the future world, the creative progress lies not in more and more external government but in greater self-government. This brings us to the question what then is the role of central government? This article examines this question in the light of an integral vision. How much the central government can decentralise? In trying to find the right answer to this question we must avoid the tendency of the average mind to float enthusiastically with the new fad and swing dogmatically towards massive decentralisation and autonomy. There is a need and truth behind centralisation. The purpose of centralisation or central government is to enforce unity, order, stability and continuity of administration. But there are two ways of achieving this propose. The first method is to create a psychological and cultural solidarity which unites the consciousness of the people through shared vision, values and ideals and a common purpose and allows each subgroup within the nation or state to organise their life according to their unique economic, social and cultural characteristics. The main advantage of this method is that it promotes a free and rich diversity which is conducive to a creative flowering of the collective life. The main drawback of this method is that if the political consciousness of the community is not sufficiently mature and developed9 the psychological and cultural solidarity of the community remains only a vague and weak sentiment without much power to weld the community into strong and enduring external unity which can safeguard it against external aggression or internal strife. The other method is to create a strong economic, social and political unity rough a centralised administrative organisation and patriotic sentiment. The main advantage here is that it ensures peace, stability and security of the outer collective life. But the main drawback of this method is that it tends towards uniformity and mechanisation of life and the concentration of power in the ruling elite and the upper classes and prevents the flowering of a free, rich and creative diversity of communal life diffused throughout the collective life. Now the problem is how to find the optimum balance which will minimise the disadvantages and maximise the advantages of both these methods. The emerging new breed of political, social and organisational thinkers with their ardent enthusiasm for autonomy, empowerment and decentralised functioning tend to ignore the need to retain the capacity for centralised function. In fact there is no real dichotomy between a strong centre and autonomous states, if by strong we mean the capacity to impose unity and order over the nation—— sometimes even by force if necessary – and ensure the sovereignty and solidarity of the nation under external aggression or internal conflict. As long as the spiritual and cultural unity of the nation or the state has not become a concretely conscious feeling in the consciousness of her people and remains only a vague subconscious sentiment, the outer unity of the nation cannot be entirely sound and secure. This is all the more true for a country like India with a wide variety of ethnic and linguistic and cultural groups. Centrifugal and divisive tendencies can any moment gain the upper hand and jeopardise the unity of the nation. In such situations of internal or external emergency, a strong centre with sufficient power and capacity for centralised decision- making and action may be crucial for keeping the integrity of the nation. Instances of gross misuse of such emergency powers in modern India have provoked much controversy regarding whether such emergency provision is necessary in the Indian constitution. We believe that an emergency provision should be there in the constitution but with sufficient safe guards against misuse of such powers. A day may come when humanity as a whole will rise to a higher level of consciousness beyond mind where it feels its unity and solidarity as a concrete fact of experience and human life no more needs any external controls like constitutions and laws and government. Until that diamond moment of fulfilment arrives for humanity, some form of external organisation and controls for maintaining unity and order may be necessary. So the problem here is not centralisation as opposed to decentralisation as an either-or issue„ The problem is how the advantages of both can be combined in an optimum proportion which is appropriate to the present and future evolutionary needs of humanity. The studies of futurist thinkers like Alvin Toffler indicate that modern society is moving towards an increasing complexity and diversity. And the past experiences of the political history of India and humanity as a whole indicate that a free diversity is essential for the power, richness and creative vitality of the collective life. So the decentralisation and local autonomy will be the dominant trends of the future. This means the political power and initiative will pass more and more from the central’ government, administration and the bureaucracy to the state and the local people. We have to examine what are the minimum powers which the centre has to retain, and the principles which must govern the relations between the central and the local authority. What are the minimum powers which the central government should retain? In the political field, foreign relation and national security-internal and external-can are under the central government. In economics some amount of central taxation which helps in funding the government is acceptable. In all other activities the central government should assume the role of the coordinator, facilitator and promoter. The functions of the central Government would be co-ordination, promotion and monitoring the progress of the states and the nation as a whole; minimising conflict and maximizing, co-operation between states; generating synergy by linking the unique strength and competence and genius od all states in a mutually complementing harmony; evolving a national consensus and vision on the long-term policy, goals, values, purpose and mission of the nation as a whole and in every department of national life. Finally keeping an overall eye on the material, social, and moral and spiritual well-being and progress of the nation as a whole with enough powers, resources and the capacity- under sufficient safe guards against misuse – to ensure unity, order and stability of the nation and a balanced development of all the organs the society. In short as the nation’s polity matures, the central government will become less and less a controlling and regulating authority and more of a coordinating and facilitating organ. All the rest of the nation’s life will come under the jurisdiction of the states, management of private enterprise and the self- government of the local people, Let us now examine how these , tasks can be accomplished in the new and emerging world, where values like democracy, diversity, autonomy are gaining increasing acceptance. But this inner solidarity cannot be achieved by mere intellectual education or by sermons and lectures or by group-singing. This does not mean as some excessively “spiritual” people say that these things are “useless”. Man is at present essentially a mental being and any inner change has to begin with the change in the “thought-process”. So anything which can give the true and the right idea and set the intellectual being in man thinking in the right direction is good and helpful for the inner change. But changing the “thought-process” is not enough. What we need is a new system of education which can make the Idea inwardly concrete, real, and living to the consciousness of the people and galvanise the thinking, feeling and active faculties of the consciousness towards a harmonious and spontaneous realisation of the idea in their inner as well as the outer life. An intellectual environment permeated with the right thought and idea, powerful technological instruments for the communication and diffusion of the idea, and an appropriate outer environment, organisations and institutions favorable to this task—–all these are very helpful aids in this challenging task. But none of these can bring any lasting and permanent change without a system of education which leads to a psychological transmutation in the consciousness of the people. Such a psychological transformation can be achieved only through a system of education based on the principles of Indian Yoga. The other function of Government which requires to be centralized is building a national vision and purpose, which means to evolve a long-term national vision which can instill in the national consciousness a sense of direction, mission and purpose. This national vision should be based on a deep understanding of the history of our culture and civilisation, the inherent genius of the mind and soul of our nation and her evolutionary destiny; it should provide to the nation a moral and spiritual cause which can at once transcend and reconcile the economic, social, political, religious and ethnic interests of the various groups within the nation. But this national vision should not be narrowly nationalistic and chauvinistic, concentrated exclusively on national self- realisation. There has to be a much greater emphasis than that given by the ancients on the special contribution of India to the progress and solidarity of the international community and humanity as a whole. Fortunately for us in India, we already have such a regenerating and unifying vision in the ancient ideal of Sanatana Dharma, in the all-embracing spiritual vision of our ancient Vedic sages, expanded and reinterpreted to suit the present conditions by our modern Rishis like Sri Aurobindo and Vivekananda. We have to explore further how to translate this spiritual vision into the economic, social and political life. 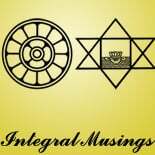 This entry was posted on April 10, 2018 by integralmusings in Polity and Governance.